It's a window into the cosmos. The cosmos (btw, I distinctly remember watching this series by Carl Sagan with my Dad since I rarely was allowed to watch TV, and can't believe that it aired in 1980!) is made from spraying vellum with ink (October Afternoon Carbon Copy) and then a couple shots of Heidi Swapp Gold Color Shine. I don't use sprays too often, but when you want a variegated effect like this there really is no substitute. 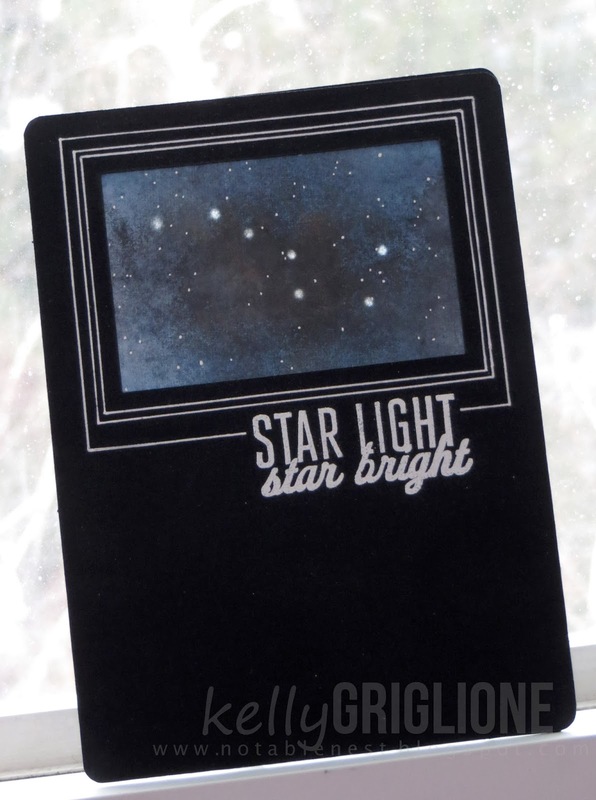 I did this over a large area of vellum and then moved the card's window around until I got the best-looking area. 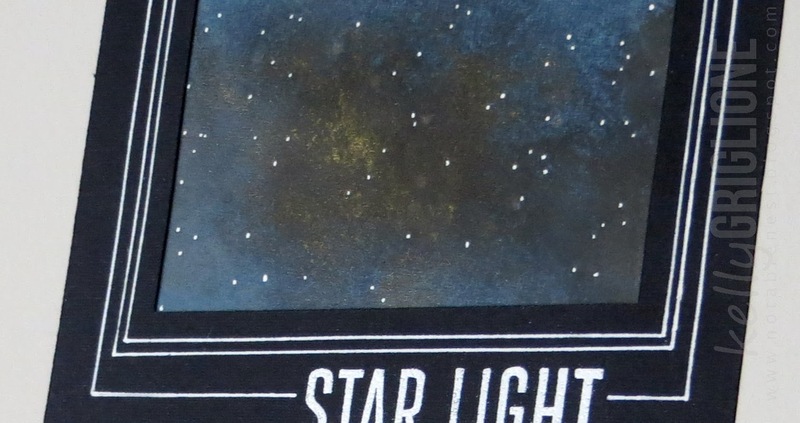 The stars are from a white gel pen. I actually pulled up a star map and used that as a loose guide on where to make my dots. I figured if I tried to do random dots they would look too evenly spaced. The frame is drawn with a ruler and a gel pen. So I told you there was a surprise, right? 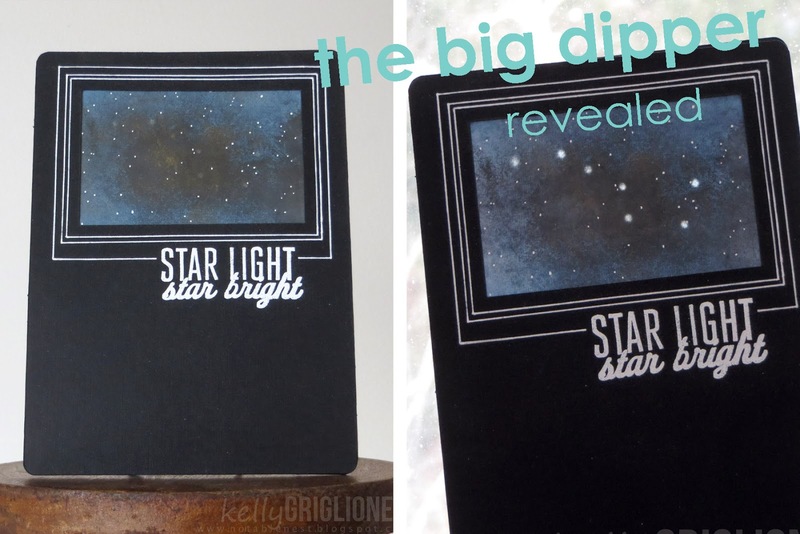 the Big Dipper is revealed!! 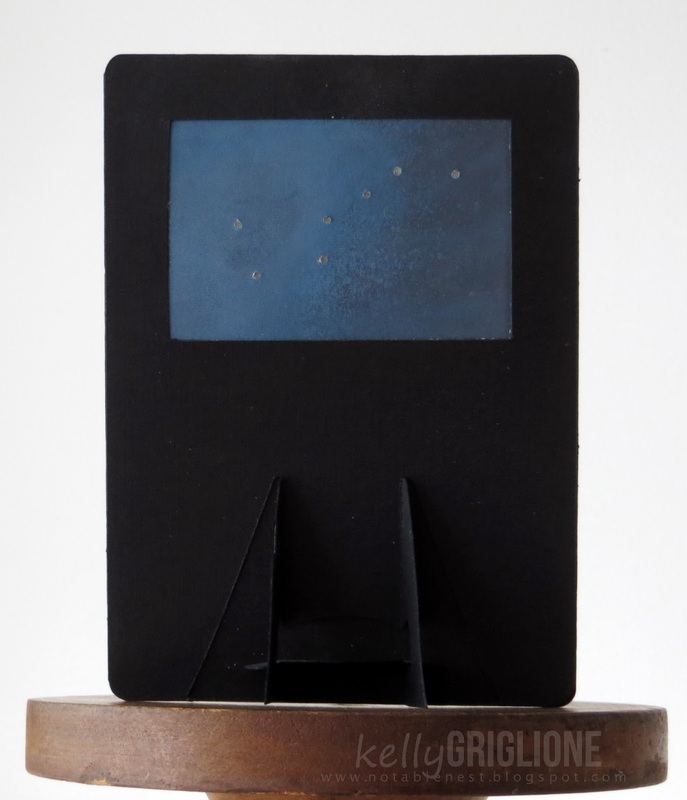 To get this effect, I added a second layer of vellum behind the front panel that I sprayed with Carbon Copy and hole punched the Big Dipper constellation. Both layers of vellum are secured between the two black card bases. 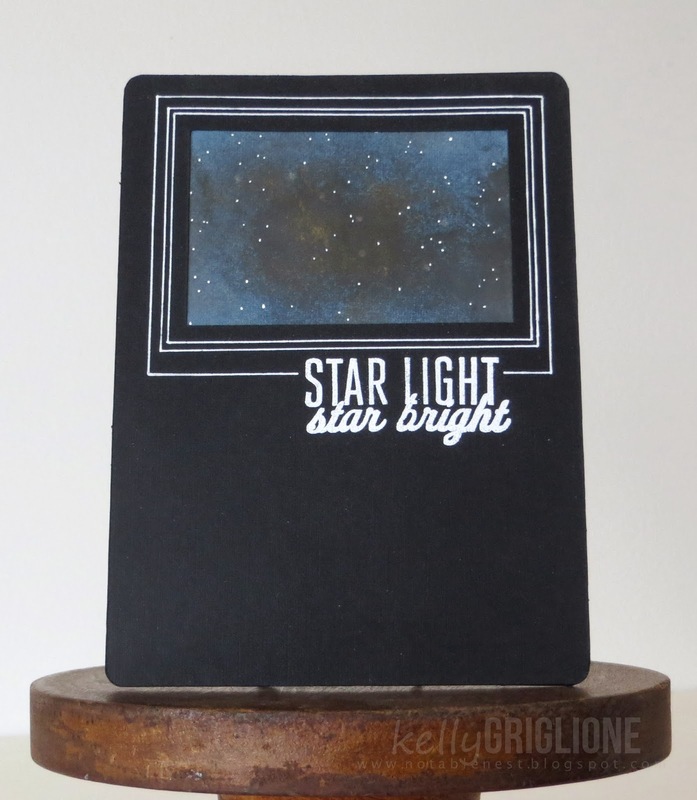 Since this is a flat card without a fold to allow the light to show through, I needed a way for it to stand. There's a "Brochure or Photo Holder" image at Silhouette that I used to make the stand, which also folds flat when not in use. 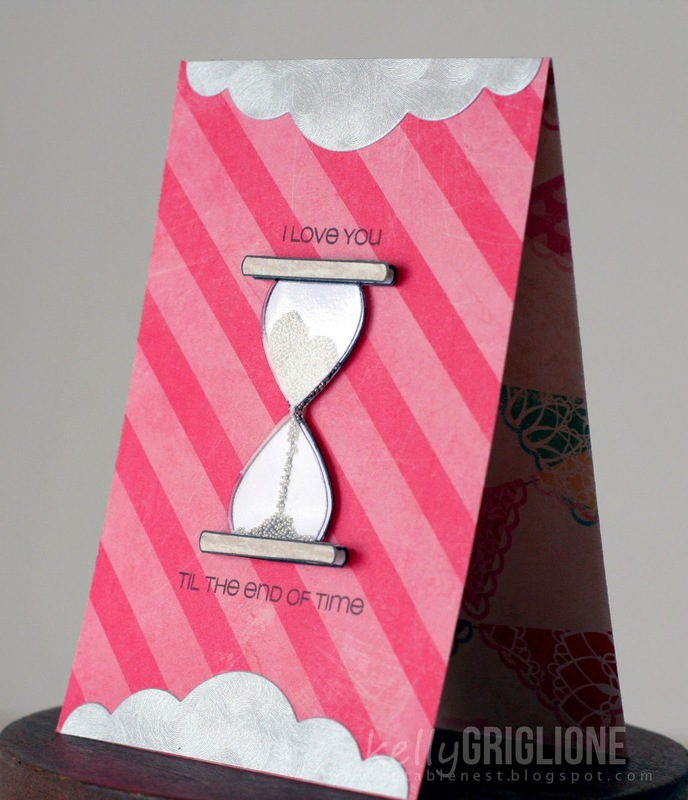 We're going off the edge on this challenge ... and your card elements are invited to join us! You've got 2 weeks to link up your project that has an element or two hanging over the edge. Now it's a double eighth note instead of a single eighth note. You can also make a quarter note by simply cutting the flag off. And now we can make some music! 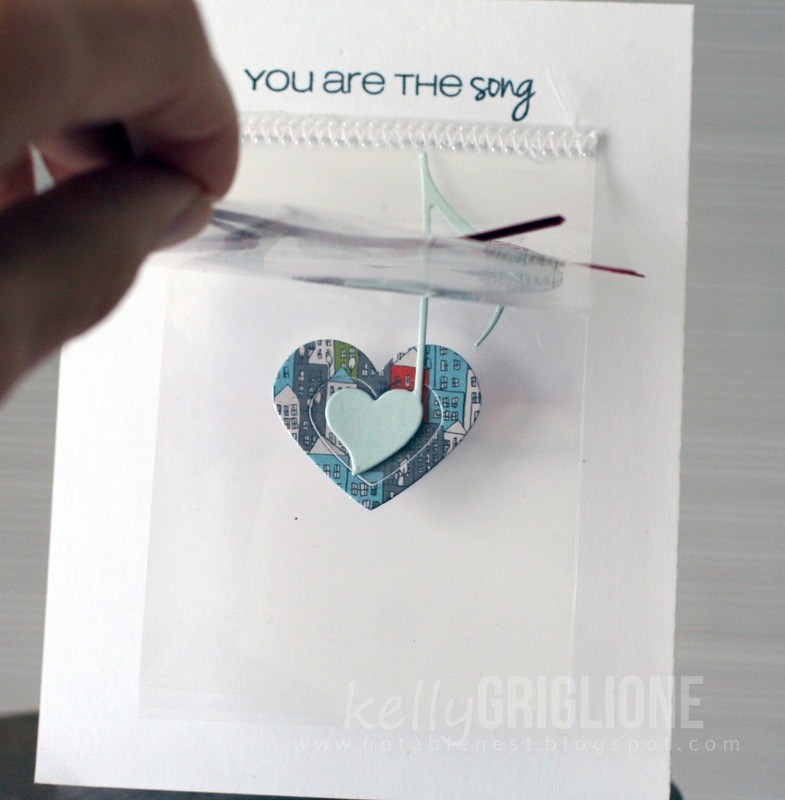 I've completely stolen the idea for using fibers to make the music staff from this card that Cristina made recently. Punching tiny holes on the sides helps keep the lines in place. There are entirely too many Valentine's cards in my shoe box, so I'm making this into an anniversary card. Wouldn't this sentiment be a fun and different way to say, "happy anniversary"? 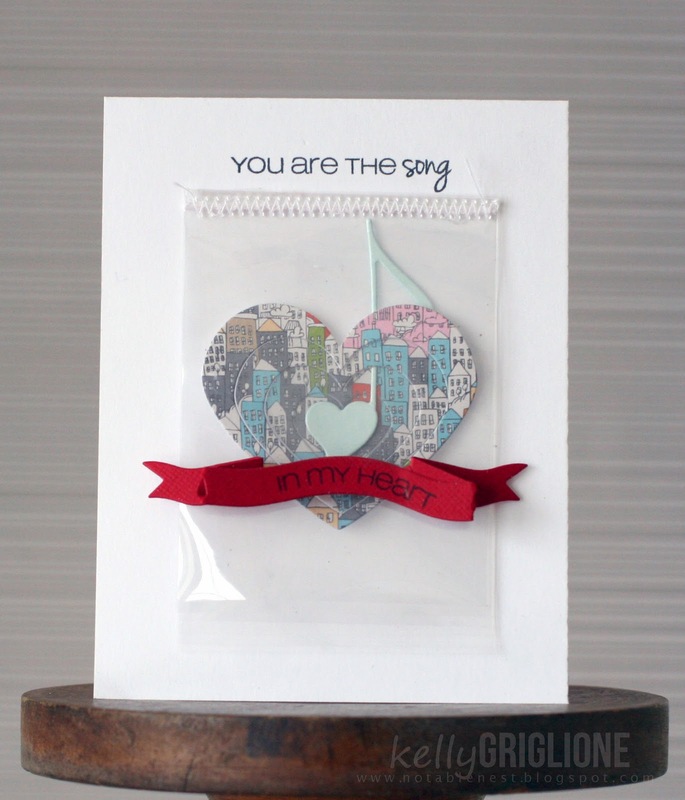 The talented winner of this challenge will receive a prize from CAS-ual Fridays Stamps! Can't wait to see your off-the-edge creations in the CAS-ual Fridays Challenge gallery. Here's a non-traditional valentine for the Fusion Challenge (a fusion of the photo and sketch). 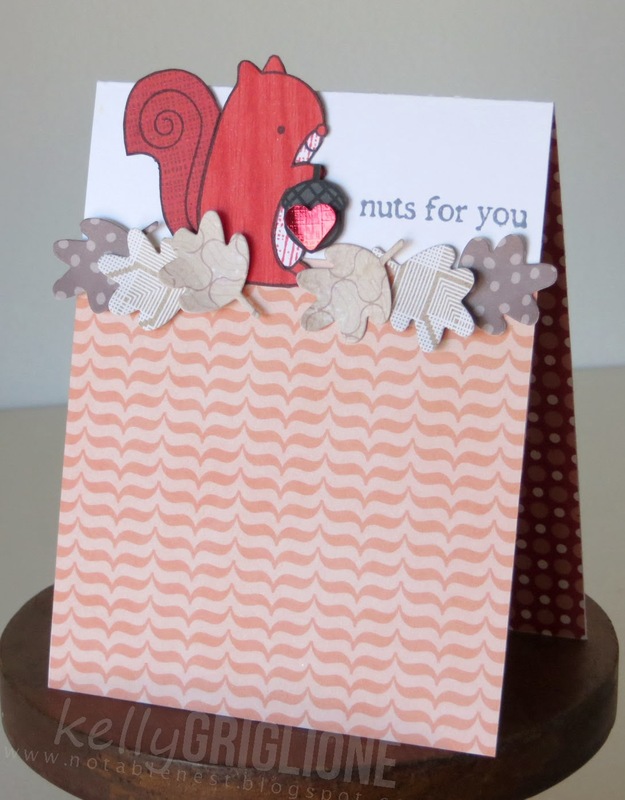 Right around the end of January I get incapable of making anything with a heart on it : ) So today we have a red squirrel from the Papertrey Nuts for You set, who's carrying a nut with a foil heart on it. I was excited that the nut is a similar shape to the heart, with a point on the end. The leaves are patterned neutrals to keep the main focus on the squirrel. I started with patterned red leaves and it looked way too busy and confusing. The paper on the front is We R Memory Keepers Simply Spring, and on the inside is Studio Calico Darling Dear. About 90% of the papers I use are 12x12, I only have a few 6x6 pads. I just get the 12x12s so cheaply that it's hard to pass by. A: Dead ant ... dead ant ... dead ant, dead ant, dead ant, dead ant, dead aaaaant. 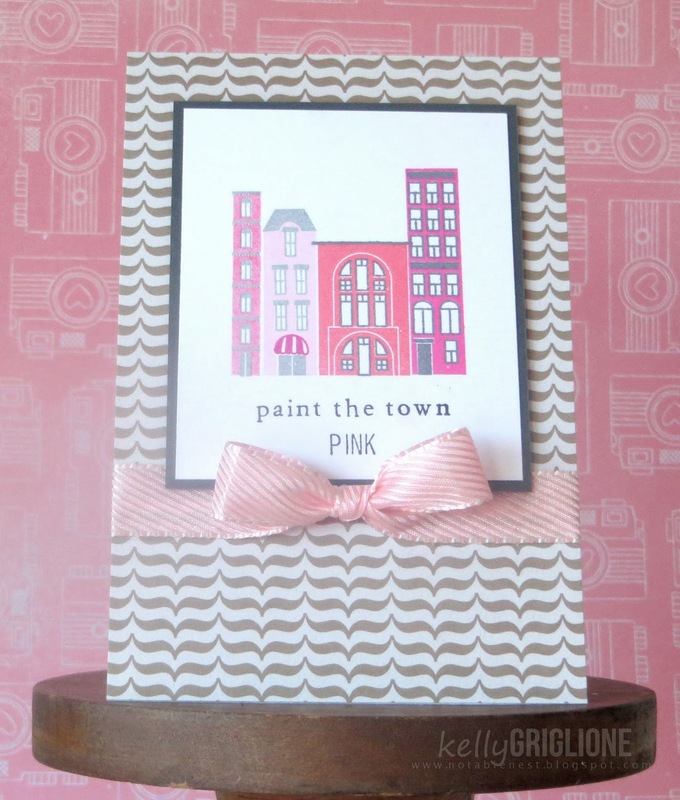 This Paint the Town Pink card is to have on hand for a friend who beats breast cancer. Not sure I can think of a better reason to go out on the town to celebrate! The sentiment is pieced together with the letter stamps from Martha Stewart's set your own stamp kit, which is perfect when you have a specific sentiment like this. In full disclosure, here's a DRAFT of my first card. I was determined to use the City Scene set I got for Christmas from my Mother-in-law. Do you get it? Yeah, it took my husband awhile too. 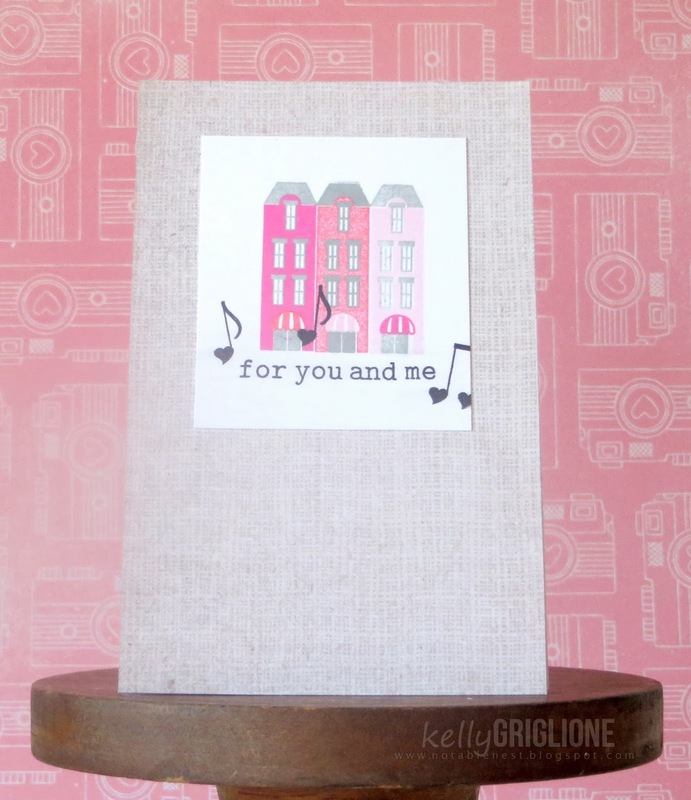 I was going for the "[little pink houses] for you and me" lyric by John Cougar Mellencamp. But as my husband pointed out, they aren't little houses. At all. And they're not the suburban houses the song is about. I thought of cutting them down and removing the third story, but I couldn't figure out how to hide the seam. So it was time to go for a different play on pink houses. Unfortunately, this afternoon I will be going to a memorial service for little Zion Isaiah Blick, the fifth brother in the beautiful Blick family. He was only here for 10 days, but will forever be in their hearts. Zion was diagnosed with a chromosomal defect called Trisomy 18 which is almost always fatal. Please say a prayer for the Blick family as they go through this difficult time. 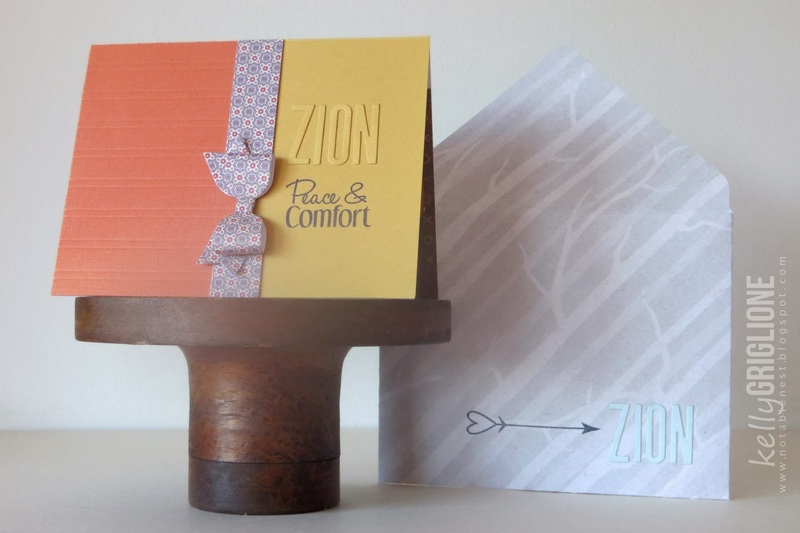 Here is the card and envelope for baby Zion's family. Today is a good day to give your loved ones an extra special kiss! Yes, I'm still loving this Sands of Time set. 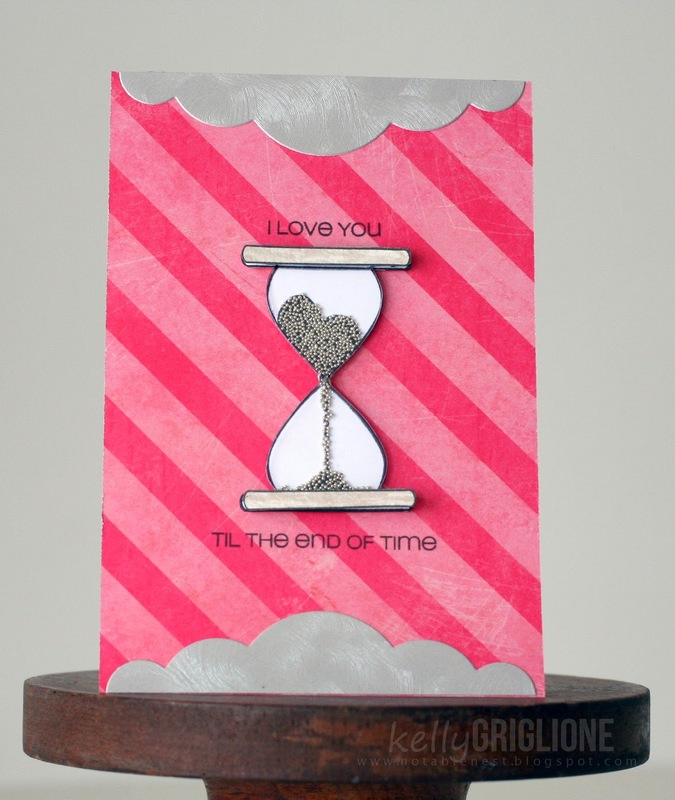 I cut the "cloud" Bubble Labels die in half lengthwise to use as a border for this card. Martha Stewart microbeads are glued on top of the "sand" in the hourglass. On top of the microbeads I have a layer of acrylic. I was pretty stumped for awhile on how to get the acrylic on top. If I stamped on the acrylic, the sand portion of the image would obscure the microbeads. Inking around the edge of the stamp would be too difficult, especially on the ends where the edge meets the sand. So finally I laid the plain acrylic over a stamped hourglass, traced the outline with a permanent marker, and then cut around the traced lines. It looks pretty neat in real life. This card is interactive! Each layer of the heart die is adhered to its own layer of plastic (left over from a sheet of photo protectors that I cut apart). The music note is also on a layer. As you flip through the layers of plastic, you uncover the "song" in my heart. 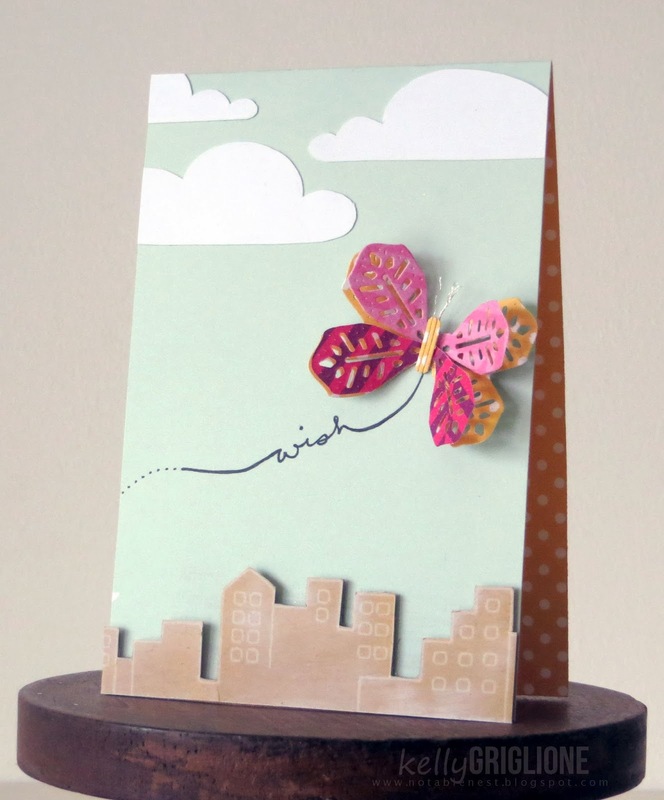 These cards are over at the CAS-ual Fridays Stamps blog today. How Many Different Ways Can You Use a Snowflake? Six, it Seems! 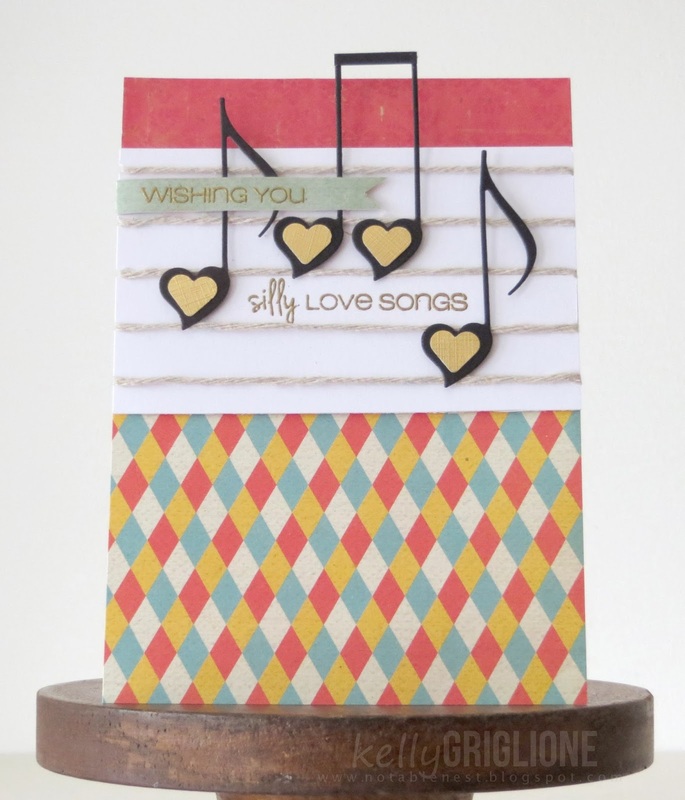 I've been locked in my craft room recently coming up with oodles of ideas to make different cards out of the same die. Although these are created specifically for Top Dog Dies, you can certainly adapt the ideas to dies you already own as well. 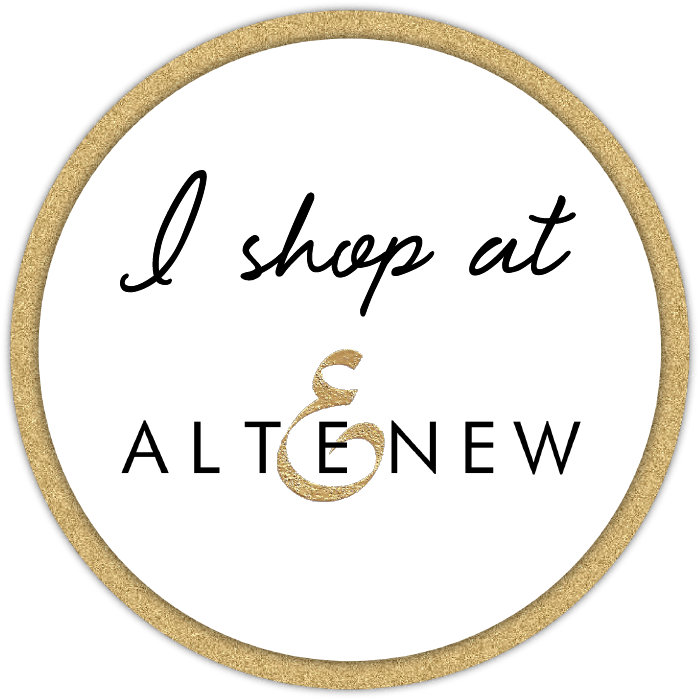 In case you haven't heard, Top Dog Dies is a new online store that offers their own brand of wafer-thin and steel-rule dies, along with dies from brands you already know and trust, including My Favorite Things, Sizzix, Savvy Stamps and Cheery Lynn Designs. 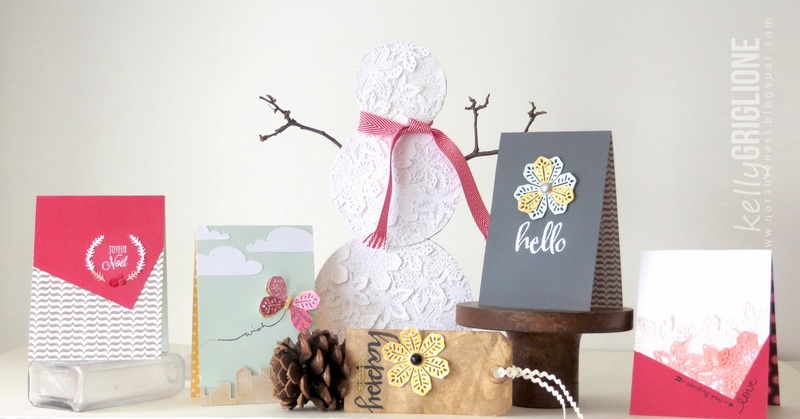 Top Dog Dies is also the leading U.S. retailer for Tattered Lace, a new line of intricate dies designed by U.K. designer Stephanie Weightman. The dies that we're going to study today are these gorgeous Snowflakes Trio Dies. 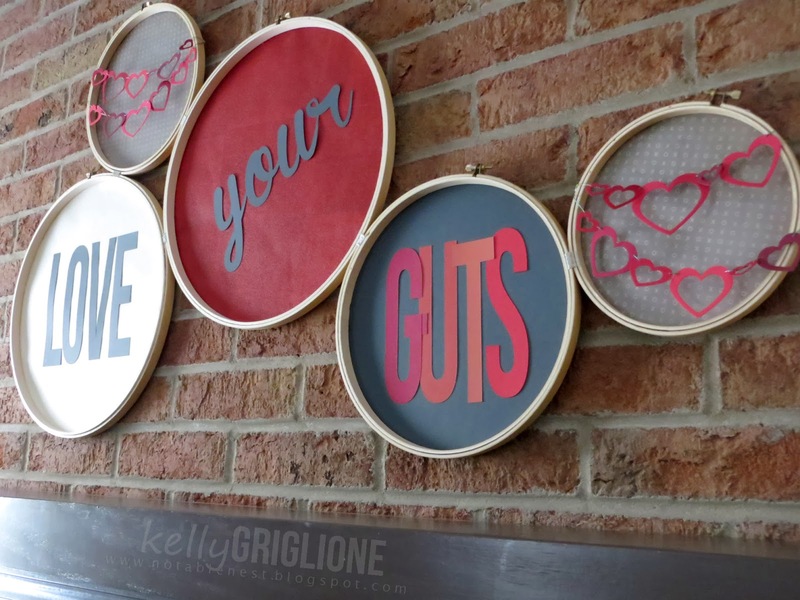 I'll show you six projects ... the first two projects will use the dies as-is, and the remaining projects will alter the dies slightly, with the intent to really stretch your supplies! 1) Change the color. 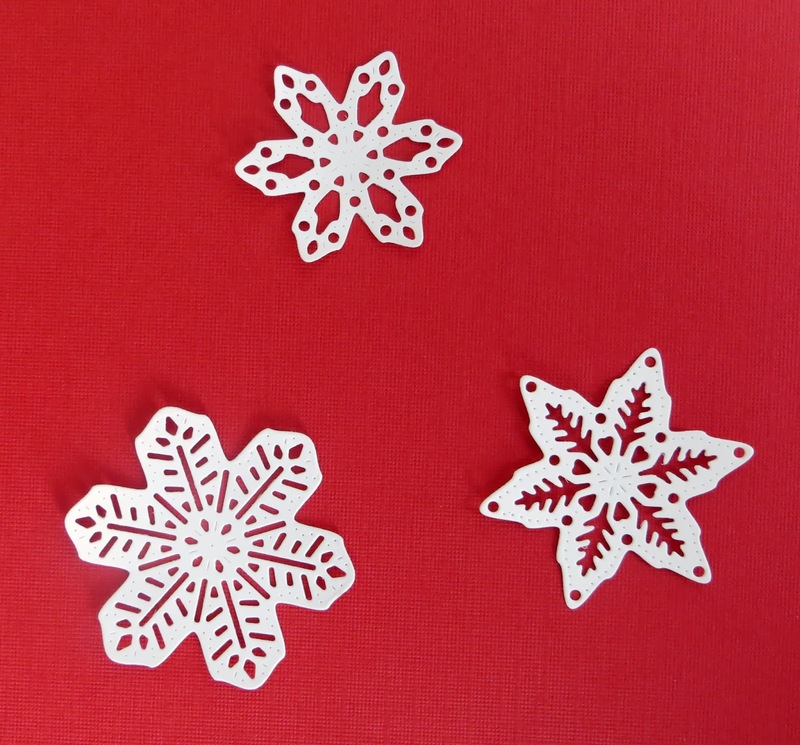 Snowflakes don't have to be just for Christmas. 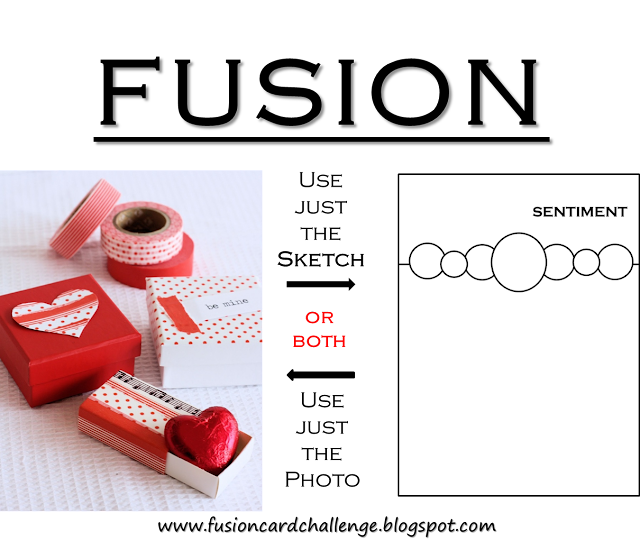 Here's a Valentine that, instead of using hearts, uses snowflakes cut in light and dark pink cardstock. They are tucked into an angled panel, almost like they've collected in the corner of a window. 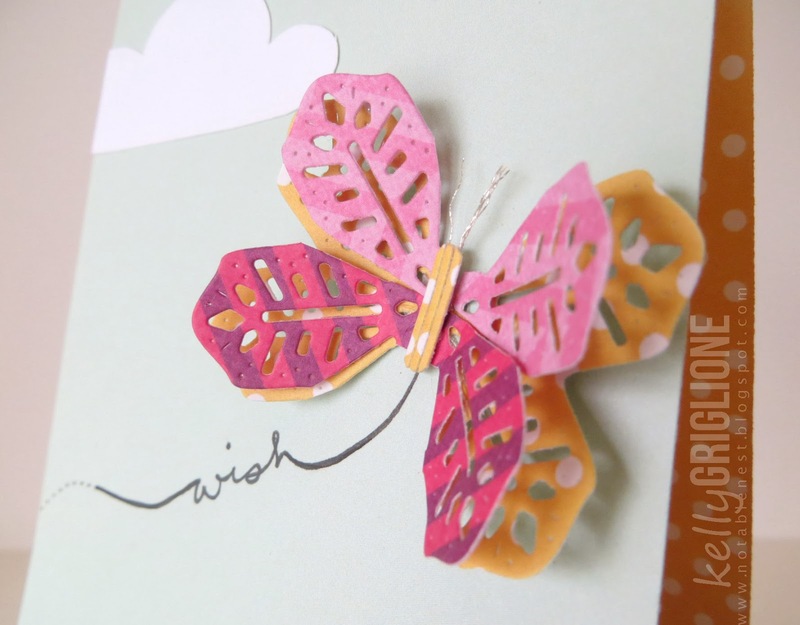 This card is an example of how changing the color of your snowflake to something other than white will change the look of it immediately without any additional work. 2). Vary the loose pieces you punch out. 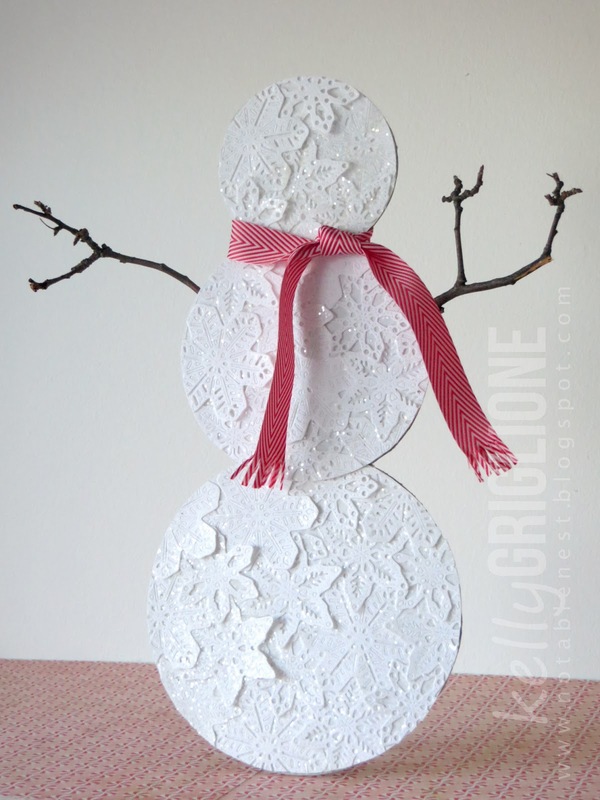 Here's a giant 12" snowman cut out of chipboard and covered in many of the Snowflake Trio dies. 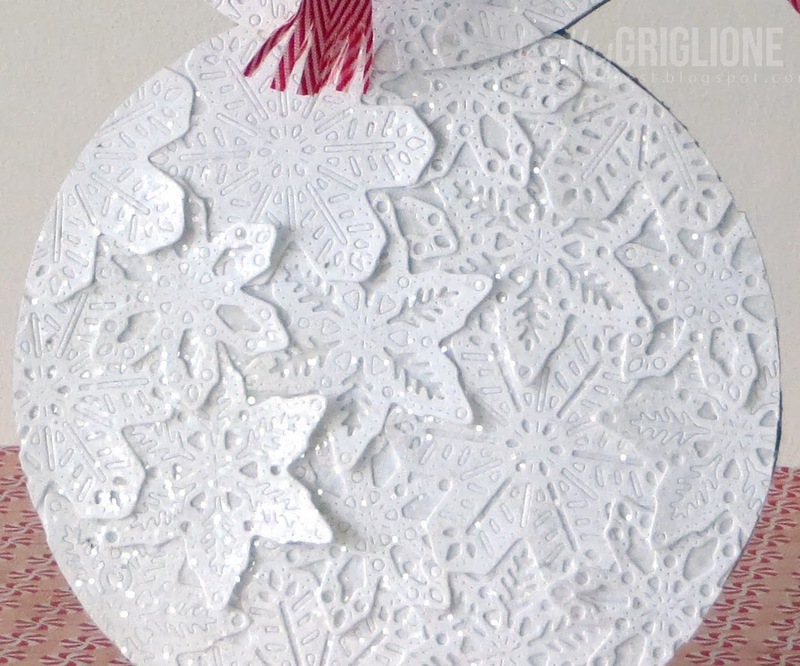 A close-up shows the different snowflakes covered in chunky glitter. Even though there are only three snowflakes, you can give the impression of having dozens of different snowflakes by selectively punching out the loose pieces. Keep some snowflakes with all the loose pieces, some with all the loose pieces punched out, and some with different patterns of pieces punched out (i.e., all the inside and outside pieces, all the middle pieces, all the lined pieces). 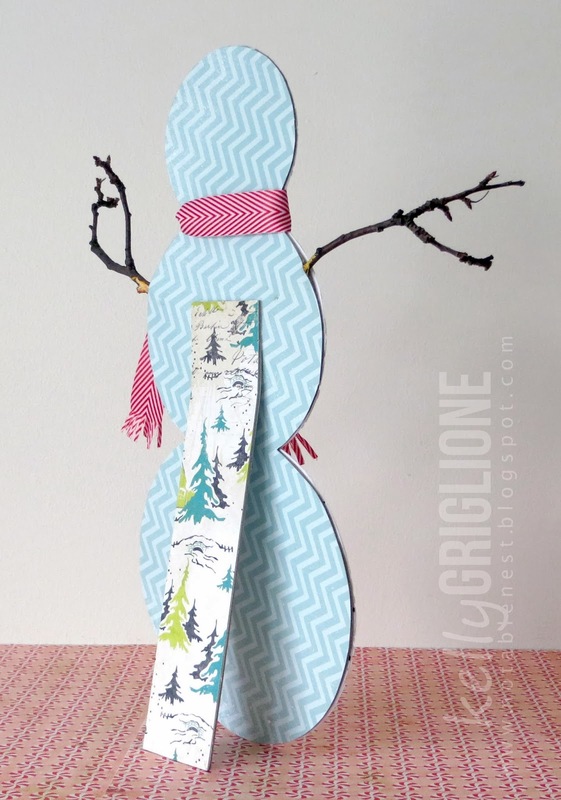 To stand up the snowman, I've used another piece of chipboard, scored 1.5" from the top so it bends out. Covering the back of the snowman and the stand is a nice finishing touch. The twigs are clipped from the tree in my front yard and glued between the layers of paper and chipboard. To avoid excess bulk, I flattened the ends of the twigs with pliers before attaching them between the layers. 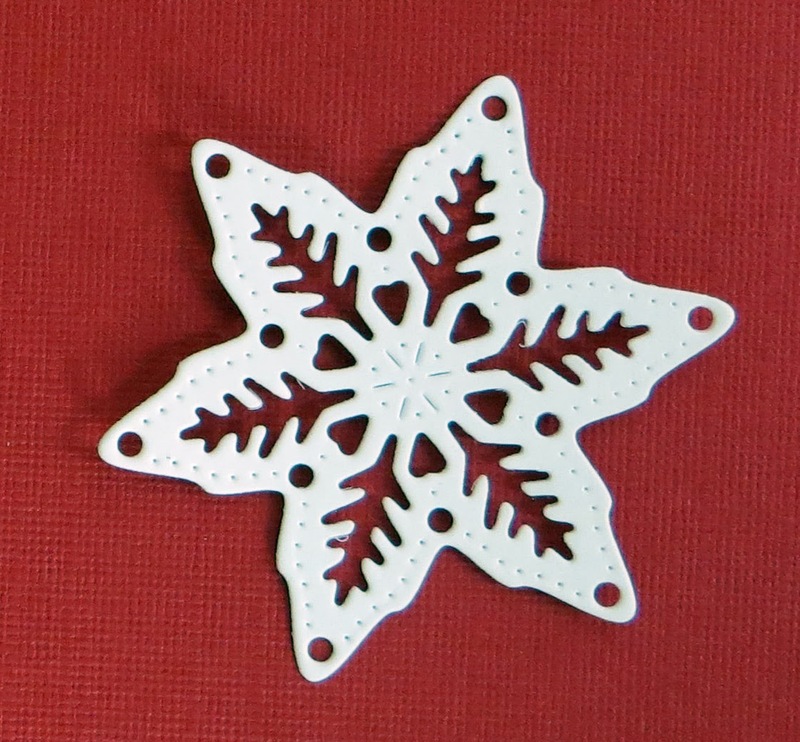 Now let's alter the snowflake dies slightly for even more looks. To see additional photos showing exactly where the dies were cut, see my post at Top Dog Dies. 3) Turn it into a flower. 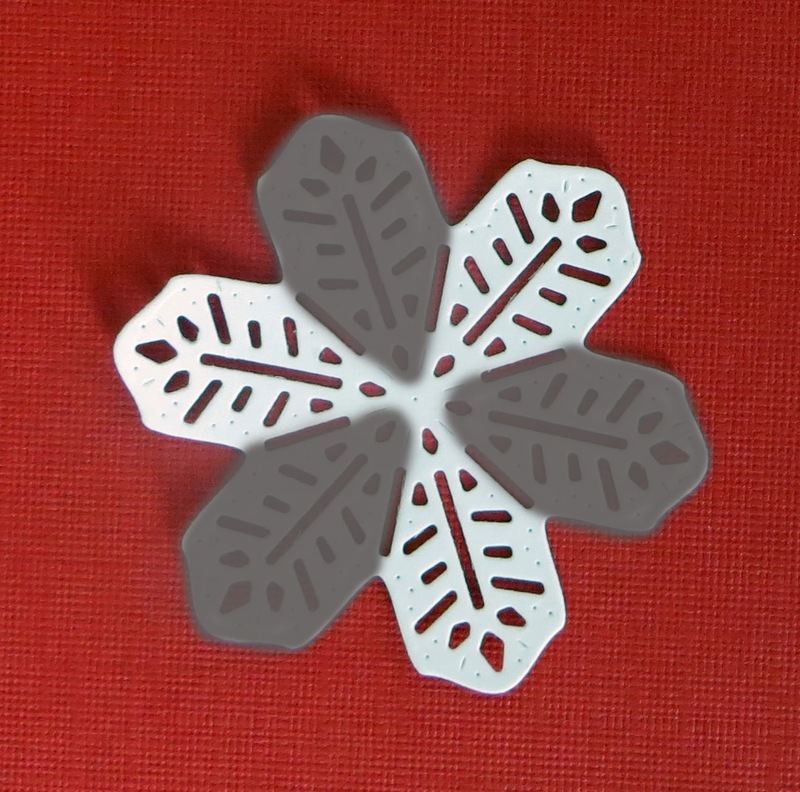 Cutting the largest snowflake between the "petals" turns it into a flower! 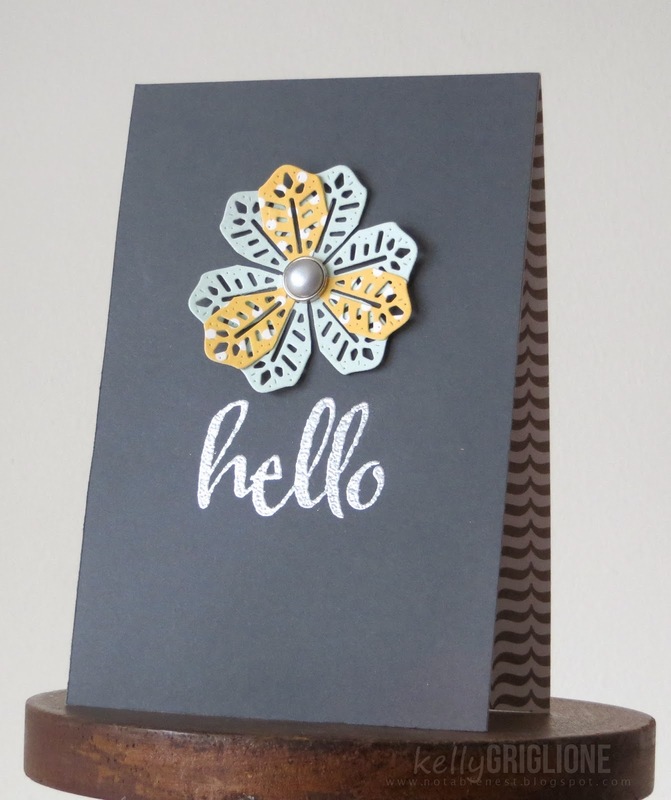 Die cut this snowflake-turned-flower in a patterned yellow paper, add it to a tag along with a sentiment, and you're done. You could easily make a whole bouquet of these. The black flower center is from the current Fusion Challenge photo that I'm nuts over. 4) Make a double-layered flower. The first blue snowflake is cut in between each petal like the previous card, but the second yellow snowflake removes every other petal so you're left with just three sections. When you layer these two, they make a beautiful flower with a colored streak down each petal. Hold the layers together with a brad. 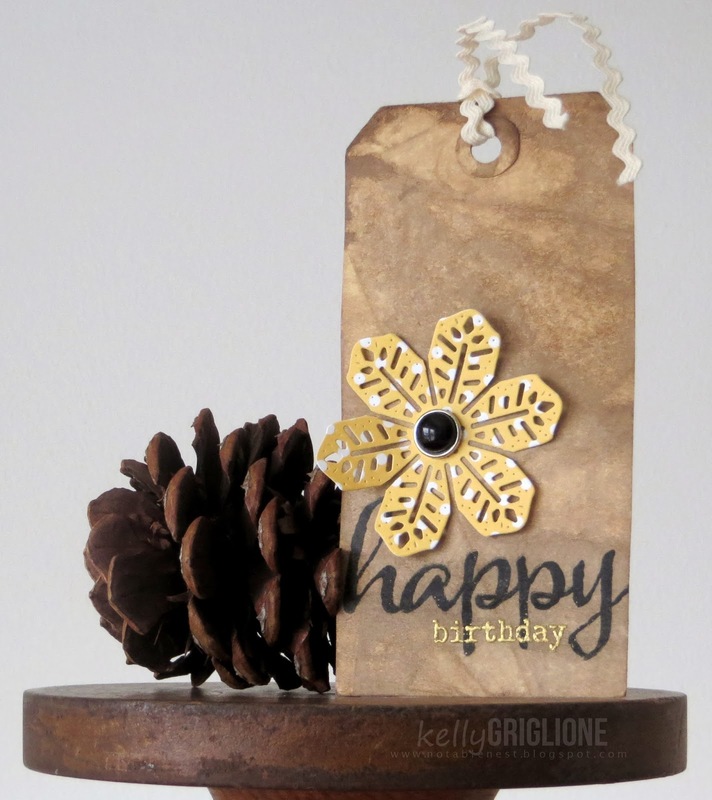 A simple, embossed sentiment, and patterned paper on the inside finishes this card off. 5) Make a butterfly. 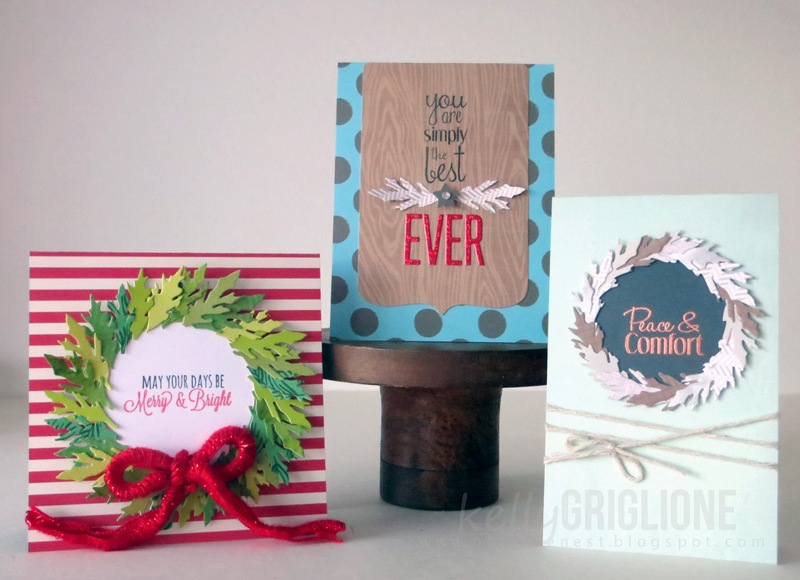 Pick two fun colors and die cut two snowflakes. Then cut each snowflake so only two adjacent sections remain, skipping the section between them. Attach one section pointing up and one section pointing down, and you have a butterfly. Again, if this is confusing, you may want to check out the post at Top Dog Dies to see exactly what sections are being cut. Here's a closer look. 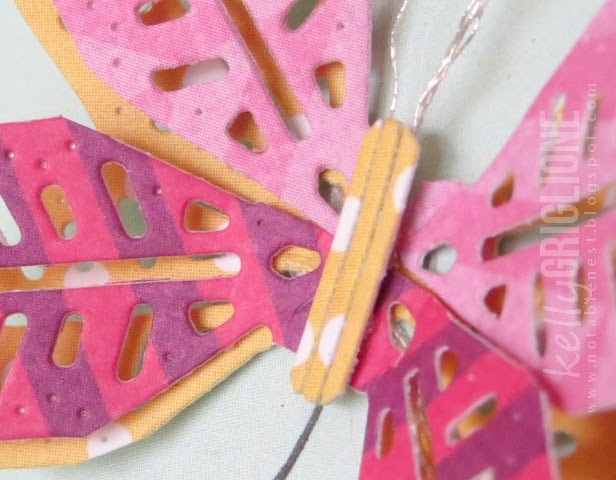 This butterfly uses double-sided paper as an easy way to make sure the colors go together. You can see there's another yellow layer underneath the butterfly to make it even more colorful. An even closer look shows the middle of the butterfly. Can you guess what it's made from? Yep, it's from those negative, long, skinny pieces going through the middle of each petal! I just lined them up next to each other until I got the width I wanted for a body. Add some metallic silver thread for the antenna and you're set. The clouds and buildings are cut out by hand. The sentiment is extended with a felt tip pen to make it look like the butterfly's flight path. 6) Use the loose pieces. 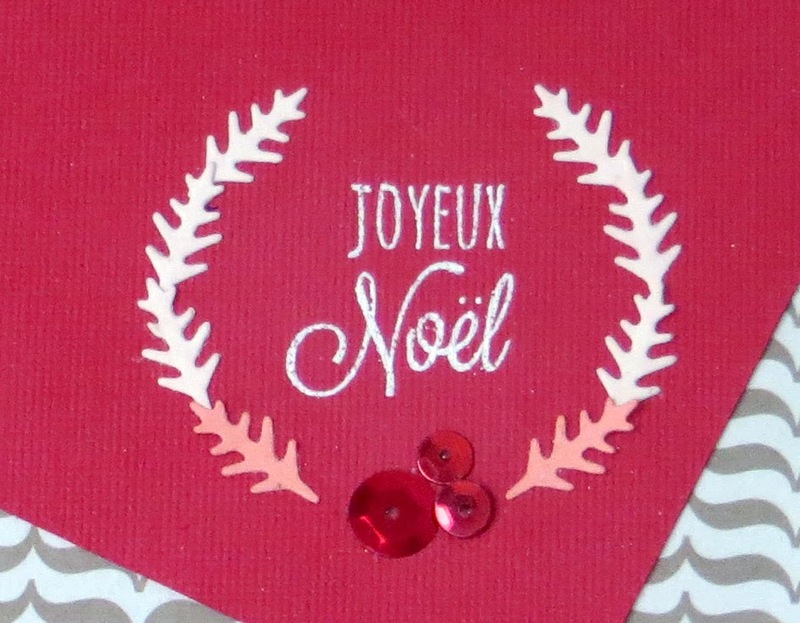 This card uses the long, spikey pieces from middle of this snowflake to make a laurel wreath. It's what I call a "left-over" card. As long as there are useable elements left over from a card, I've been trying to make another card with those elements while I still have all the supplies out. 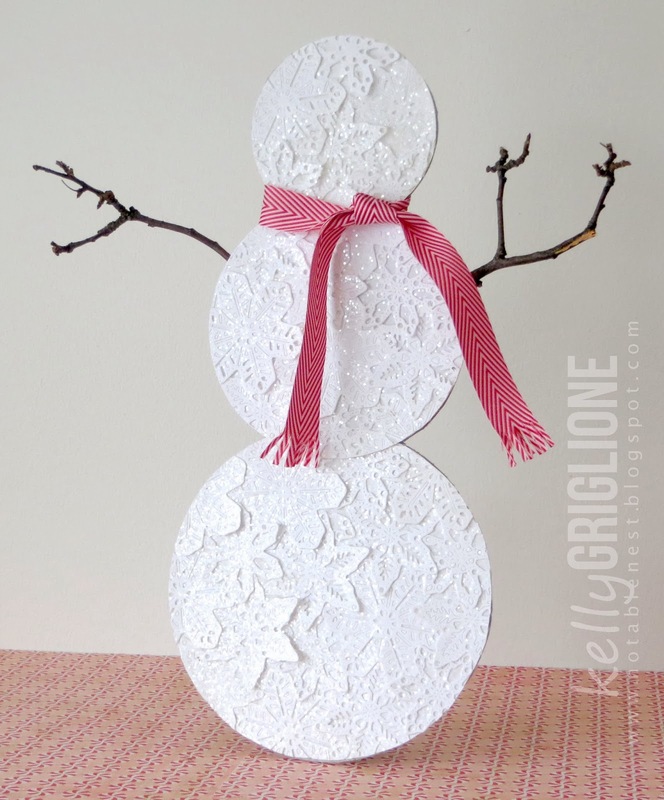 This one uses all the left-overs from the first card with the pink and red snowflakes. The angled panel is the negative from that first panel, and the long, spikey pieces are from the snowflakes. Layer the long, spikey pieces along a curve on both sides of your sentiment and add some sequins. Done. And there you have it ... snowflakes used 6 different ways. 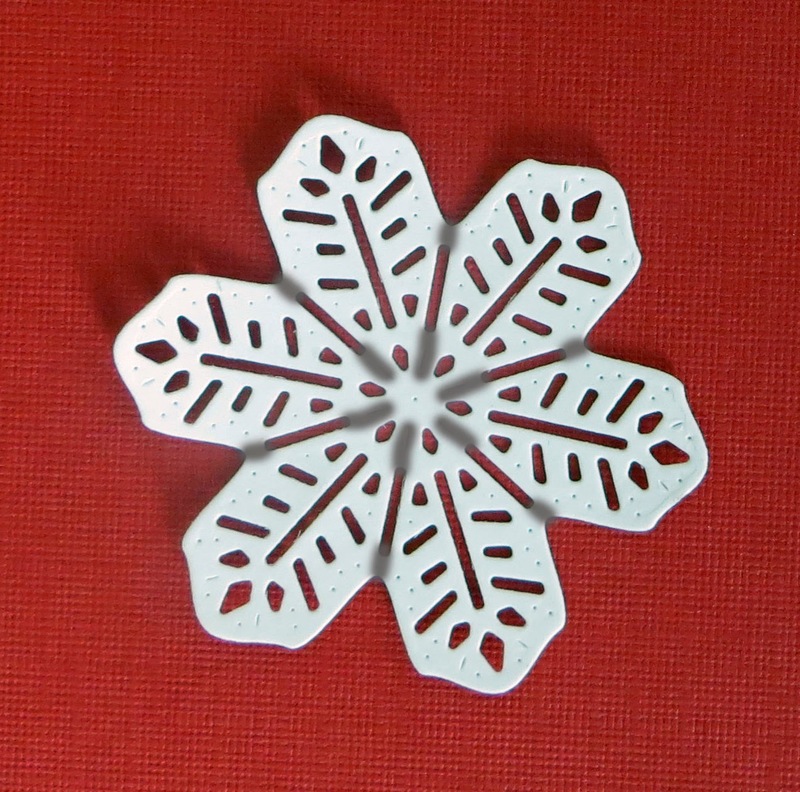 I hope you've come away with some ideas for the snowflake die, especially those not in any way related to Christmas or winter. Here's a bonus set of cards featuring a few different looks from cutting apart the Leafy Branch Die. Once you cut the leaves off the die, you can use just two of them to break up a sentiment, like a dramatic pause in speech. 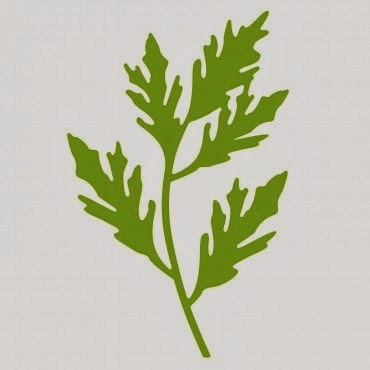 Here the leaves are used in a single layer around a ring of cardstock for a sympathy card. 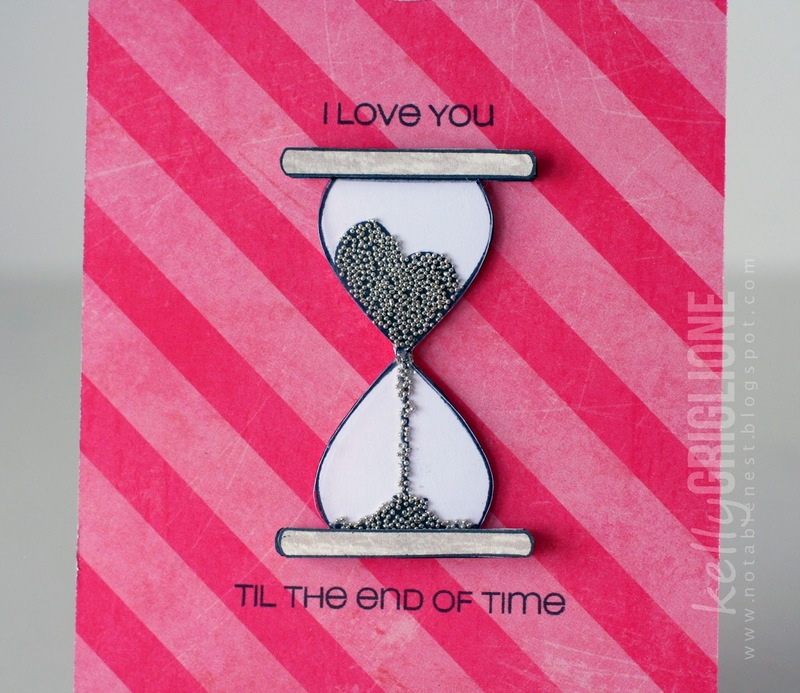 The sentiment is below center to tie in more with the twine wrapped around the card. Instead of lining the leaves up around the ring, you can fan them out to create a more extravagant wreath. 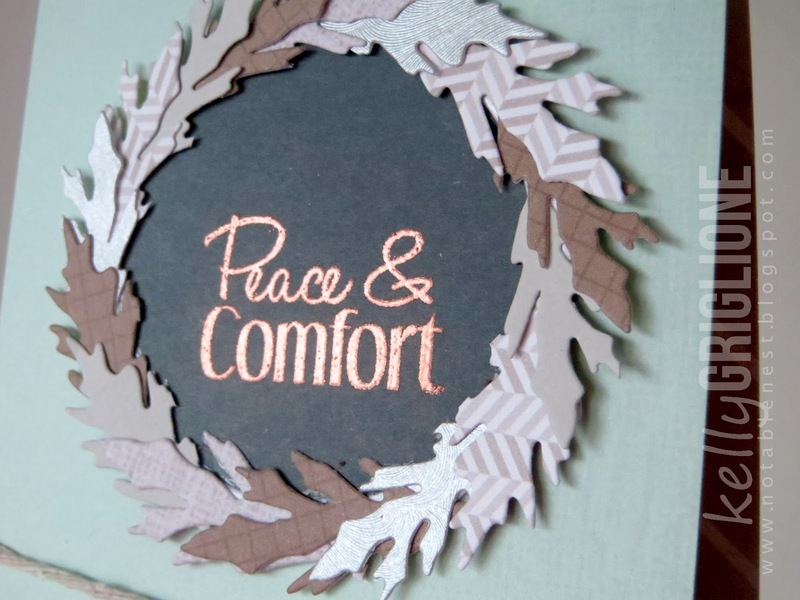 There are 7 different shades and patterns of green used to give this wreath more depth. The bow looks very thick and difficult to mail, but it's actually very squishy and flat. 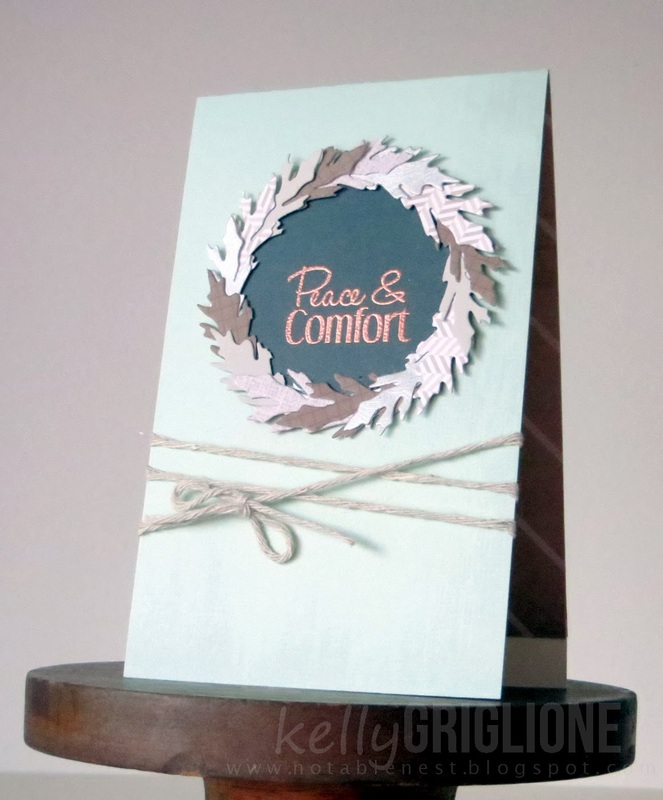 Double sided paper from American Crafts Kringle and Co. decorates the inside of the card. 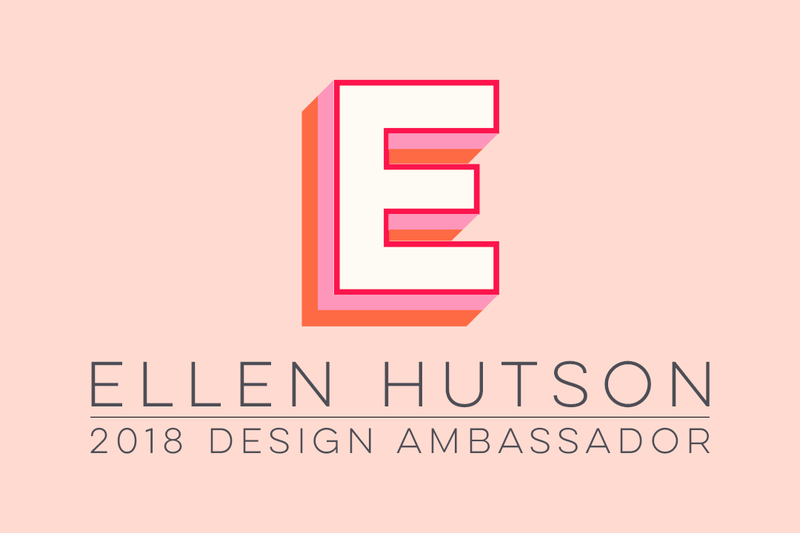 And if you've made it through all of those projects, you certainly deserve a free giveaway!! The deadline to enter the giveaway is Sunday, Jan. 26 at midnight. 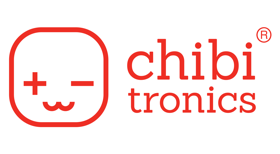 Thanks so much to Top Dog Dies for inviting me to use their products and post on their blog. I really enjoyed myself and had a lot of fun! Folks, I am super-excited about this one! This may be one of my favorite projects yet. Really. 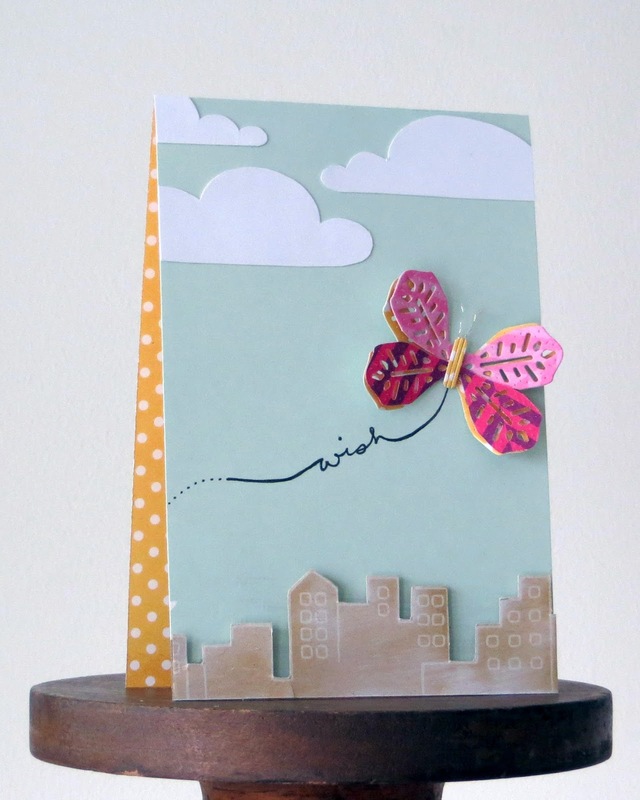 The inspiration is the current 2 week CAS-ual Fridays Challenge to use big blocks of color on your project. Before I get into the project details, how do you like my imitation of the hold-your-project-outside-and-crop-your-head-off style of photography of the big-time bloggers? I see photos like this by Rebecca Cooper or this by Dear Lizzy and am utterly charmed. As charming as those photos are, the actual process of getting the photo was not so romantic for me. I wish someone had video taped us ... my 6 year-old, with his boots unzipped because he had to get out of the car in a hurry after me yelling at him to put down your tablet or else, holding the heavy DSLR in a random townhouse parking lot with me trying to explain how to depress the shutter half way before my fingers froze off in the 15 degree weather. 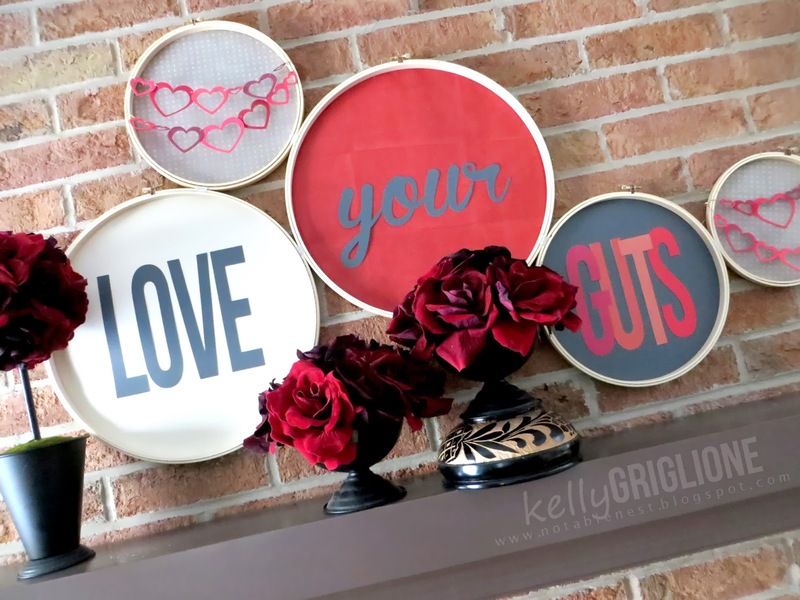 So, wanna see how this came to be, and how I've used it as a Valentine's Day decoration? You probably already know this trick, but I didn't until I watched a video. 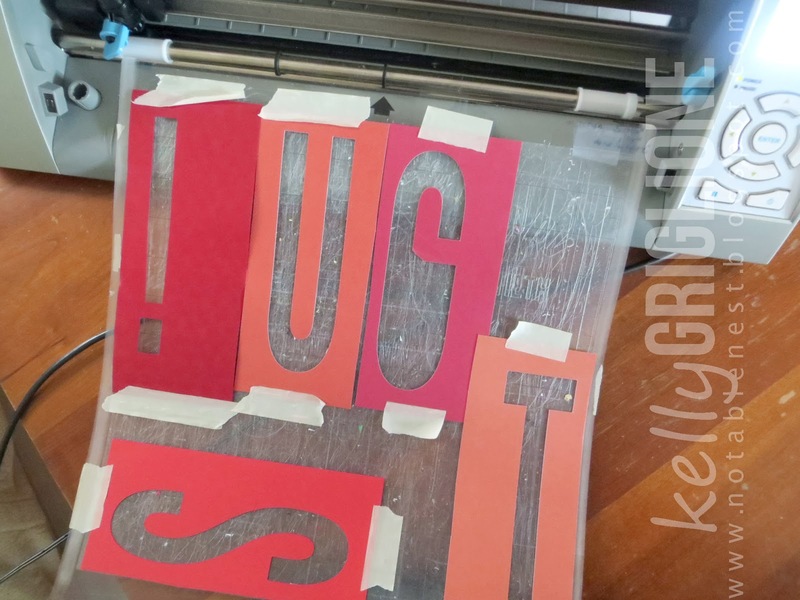 An efficient way to cut images with multiple colors and/or layers is to cut out papers slightly bigger than the size of your image and place them in the right spot on your mat. That way you can get all the cuts in one pass through the machine. I'm also guessing you've noticed the tape on my decidedly unsticky mat. It's quiet pathetic. I just need to buy a new mat! 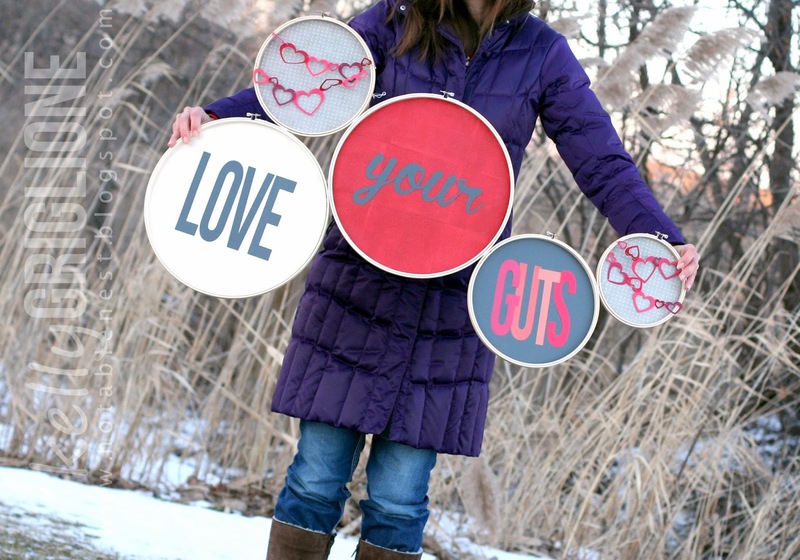 I purchased several embroidery hoops from Michael's. 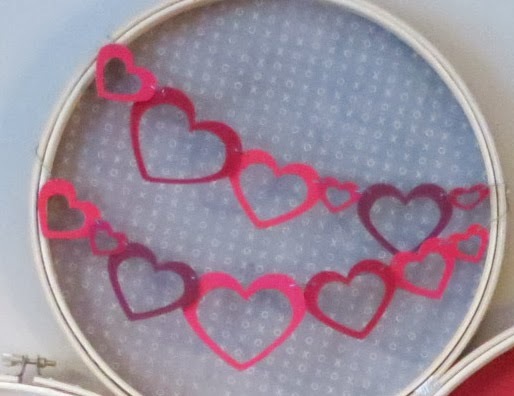 Arrange the hoops on your floor and lightly mark with a pencil where the intersections are. 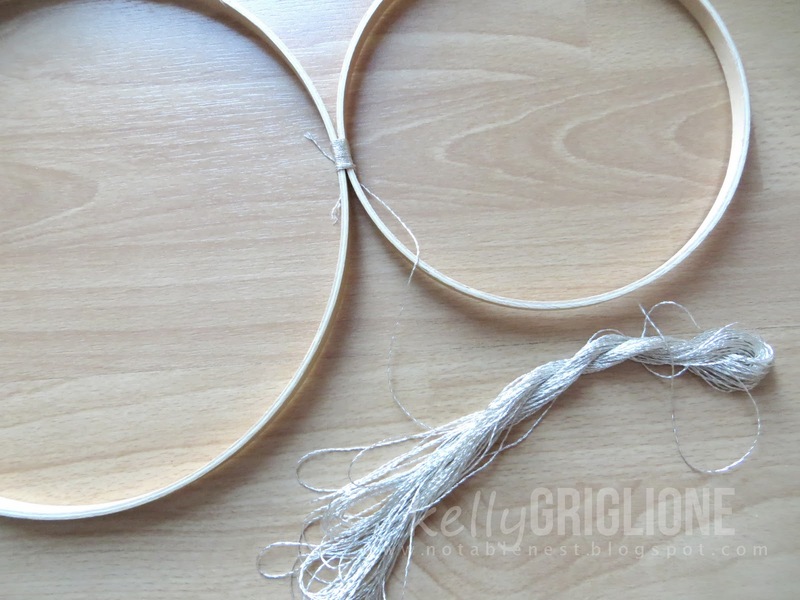 Wind silver embroidery floss tightly around hoops for about 3/4". The wider you make the bindings, the more stable your structure will be. Mine hangs from a single point and is relatively balanced. 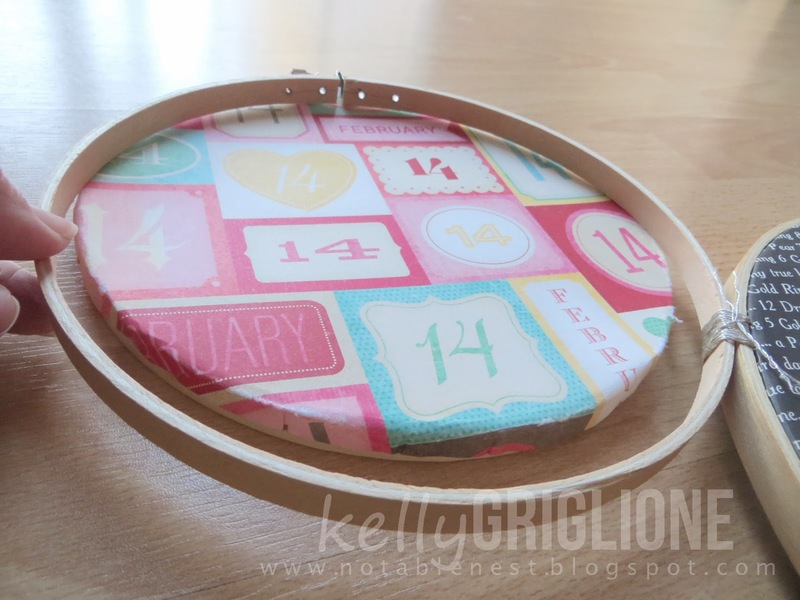 For the patterned paper background, cut out a slightly larger circle than the inside hoop and bend paper over the hoop. Using a water brush really helps with this for thicker cardstock. Brush around the circle, wait a couple minutes for the water to soak through, and try again when the paper is more pliable. Trim if necessary. Then sandwich between the two hoops. Note that the two largest hoops are 14" in diameter ... 2" bigger than 12 x 12 paper! So I used the wallpaper my mom picked up at a garage sale. The red side is the pattern (would this be for a dining room?!?) and the textured cream is the glue side. 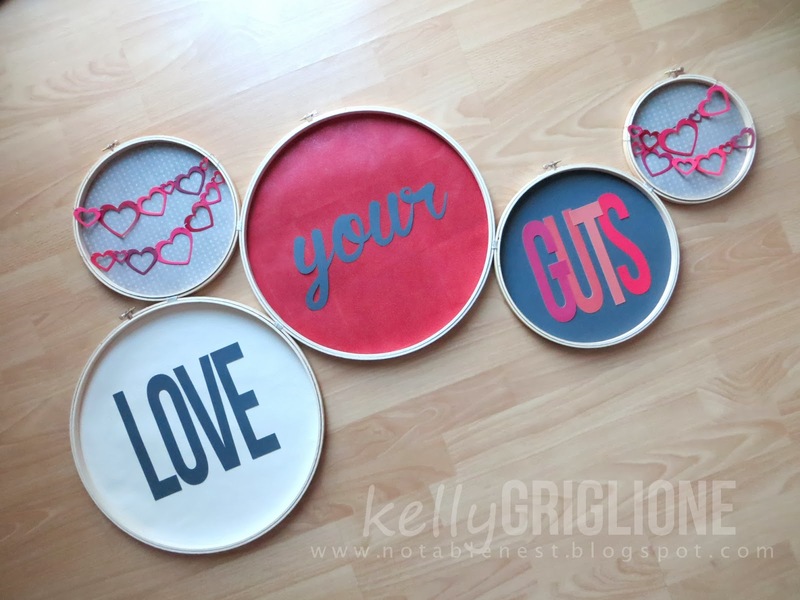 Cut them out of different shades of red, punch two tiny holes at the top of each, and then stitch together. Inspired by the lovely Wida of Beachorado, here's a gif of the hoops coming together. It's over the fireplace mantle!! I played with having "your" on an angle, but ended up putting it back to being straight. This is why I'm never aggressive with adhesive. Things are always being moved around. I liked it on the brick wall, but it was still missing something. So I took at trip to the basement and came up with some Valentine's Day decorations. Adore these velvety roses! 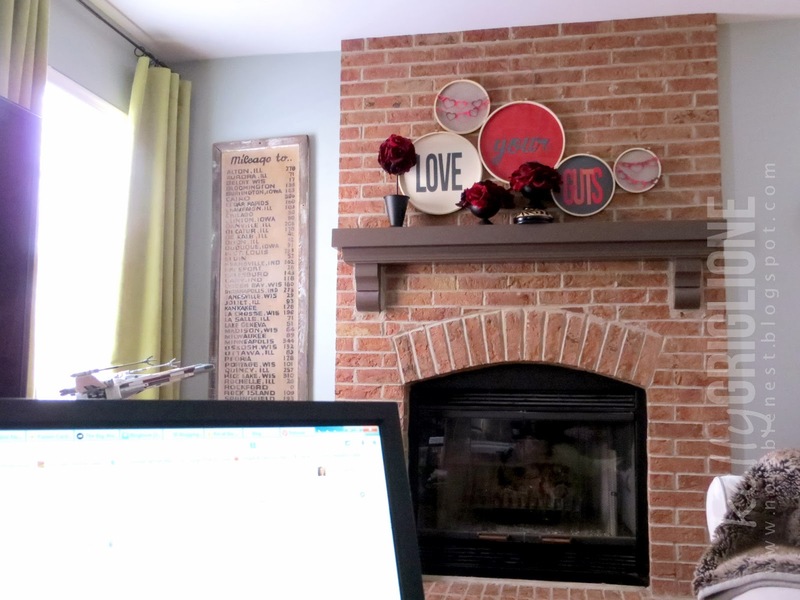 So happy with how they fill the space and bridge the gap to the mantle. I was so excited to come downstairs this morning and see it again!! I'm a total craft dork : ) The stand under the right bunch of roses is a carved souvenir from St. Lucia, without its pointy top. Anything else I tried as a stand was too distracting because it wasn't black. This not only has the black of the bases, but also the naked wood like the embroidery hoops. Incidentally, I considered spray painting the hoops in a nickel finish. Perhaps for the next project. That's another neat thing about this project ... for each holiday or season you want it, just make different circles to put in the hoops. They aren't adhered to anything, so they pop out once you slide the hoops. Well, thanks for sticking with my long post. Hope you liked it, even though it's not a card! 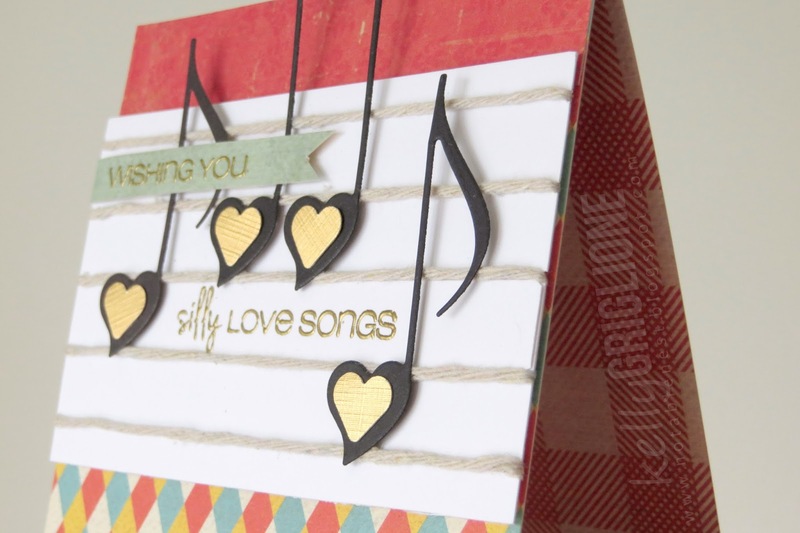 The talented winner of this challenge will receive a prize from CAS-ual Fridays Stamps! Can't wait to see your color blocked creations in the CAS-ual Fridays Challenge gallery!